On a mission to explore the fate of the yellow cedar tree in Southeast Alaska, Stanford University doctoral student Lauren Oakes discovered a surprise: the resiliency of forgotten forests that recovered from years of climate change impacts. In her new book, In Search of the Canary Tree (Basic Books, 2018), Oakes shares the stories of hope she found in Alaska: communities coming together, species adapting to new conditions and people finding ways to help those less fortunate than themselves. Here, Oakes, also an adjunct professor in Earth system science and a conservation scientist with the Wildlife Conservation Society, discusses what she gained from immersing herself in local communities and what we can learn when we look beyond science. In the end, I feel that hope is this idea that somebody else might fix it. We’re looking for policy, or looking for everyone to get onboard with the Paris Agreement, or looking for President Trump to turn around, but I think more can come from individual action. 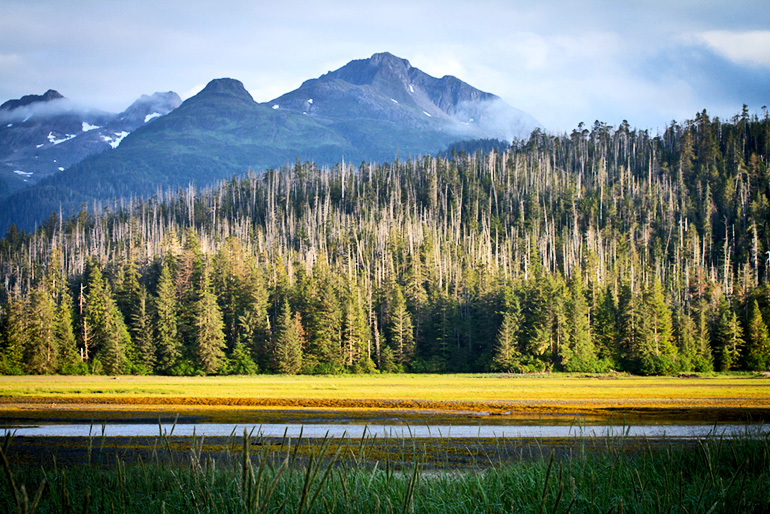 In Southeast Alaska, the people rely upon these trees in different ways, and many who were knowledgeable of the changes were altering their uses accordingly. There was a man who was innovating his business to rely on different species. Other people were making use of the dead trees instead of choosing to harvest the live ones. Those are all small pieces of the puzzle, but they’re informed by an understanding of what’s happening in a local ecosystem. Also, these activities are an acknowledgment that we have an inherent connection to nature where we’re drawing on certain resources. Adapting is about understanding the negative consequences, but also looking for opportunities. To say that taking advantage of dead trees is an opportunity sounds a little funny, but in some ways it’s a form of innovating to respond to what’s happening in the ecosystem and still drawing what people need from it. I would push for more local science, local action, and local understanding because we’re going to need to start adapting at that scale. That’s where people’s lives are carried out. The science is often at a different scale—focused on global averages, for example, or future scenarios. We modeled the future vulnerability of the species based on factors like soil drainage and snowfall and assessed perspectives on how we should manage national parks, where the species persists, in light of climate change. Despite the fact this species has a unique vulnerability to climate change, there are some individuals that still survive—that was profound to me, both scientifically and philosophically. We still don’t know why some of them do better. I went into my interviews thinking I was really clearly looking for behavioral change in terms of how people might adapt to the changing environment. What I found was a lot of people were also experiencing a psychological component of loss that came with knowledge of what was causing it—as well as a connection to the resource. The more connected people were and the more knowledgeable they were about what was causing the loss, the more they had to deal with psychologically. There were days in my research where the measurements took twice as long as they usually did because so many species were trying to compete into the canopy. These sites in the chronosequence—a series of forested sites affected by the tree mortality at different points in time—were like forests in a middle-life crisis, not really sure what they’re going to be yet. We were measuring what was growing up and around the standing dead trees. Not enough time had passed for another species to take over. Those were tough days for fieldwork, but they convinced me that amidst the loss, there was also a story of regrowth and recovery. That was where the idea, both scientifically and philosophically, came from—that there’s some hope that this is going to become something new. During my second summer of field research, I wrote a blog for the New York Times about my research. The writing process helped me see that there was more content waiting. There was a story beyond the science—something personal lingering—and there was also more description that I wanted to give that couldn’t be present in a scientific paper. There are two stories about native weavers in the book. They talk about these trees in terms of another level of connection, like a family member. That’s the metaphor that I end up using because, having lost my father while pursuing this research, it’s the one that I could relate to. These trees represented generations for them. As we see climate continue to affect pockets of this planet—the California fires are a good example—there’s a lot of room for reaching across boundaries, helping others, and figuring out the places where we can still draw on resources we need and distribute them effectively. I feel like we all have a responsibility to help one another as the impacts continue, because they will.